The two performances were the culmination of the 2017-2018 session of the NYU Tisch Graduate Musical Theatre Writing Program’s Opera Lab. Collectively they featured eleven short operas written and composed by NYU graduate students and performed by AOP’s professional opera singers Keith Browning, Alexa Jarvis, Kathryn Krasovec, Yoojin Lee, Nicole Mitchell, Jordan Rutter, Nathaniel Sullivan, and Amelia Watkins, who additionally acted as mentors through the duration of the program. 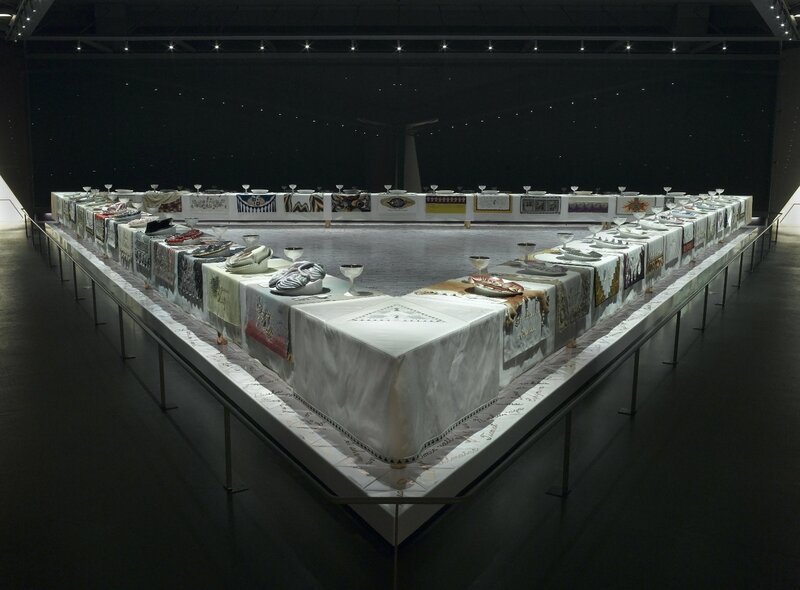 The operas themselves were inspired by The Dinner Party, an installation of feminist artwork by Judy Chicago currently housed at Brooklyn Museum. The Dinner Party, an important icon of 1970s feminist art and a milestone in twentieth-century art, is presented as the centerpiece around which the Brooklyn Museum’s Elizabeth A. Sackler Center for Feminist Art is organized. The Dinner Party comprises a massive ceremonial banquet, arranged on a triangular table with a total of thirty-nine place settings, each commemorating an important woman from history. The settings consist of embroidered runners, gold chalices and utensils, and china-painted porcelain plates with raised central motifs that are based on vulvar and butterfly forms and rendered in styles appropriate to the individual women being honored. The names of another 999 women are inscribed in gold on the white tile floor below the triangular table. This permanent installation is enhanced by rotating Herstory Gallery exhibitions relating to the 1,038 women honored at the table. Some students chose to interpret the mythos of these women literally, while others reimagined their lives or simply drew inspiration. The historic pieces included “Master” in which Emily Dickinson reckons with the life of her poetry in the aftermath of her death. It featured music by Jacinth Greywoode and libretto by Deepali Gupta. In “A Drop in the Ocean” (music by Bryan Blaskie and libretto by Christine Claudel Filimonova), Christine de Pizan, the first women to earn a living wage as a writer, interviewed for her first job after the death of her husband. Spencer Robelen and Seth Christenfeld’s “An Unbroken Line” took place in Egypt, 1458 BC when the pharaoh Hatshepsut, in the twilight of her reign, is beset by palace intrigue orchestrated by her sister and carried out by her heir. “Waiting for the Rain” built from the legacy of Hildegard von Bingen, a medieval nun, composer, scientist, and prophetess, with music by Kevin Cummines and a libretto by Clara Luthas. “Judith and Holofernes” (music by Mehmet Salih Yildirim and libretto by Lily Dwoskin) depicted the Biblical heroine, Judith, and her slaughter of the infamous General Holofernes. Other operas took a more varied approach, some reinventing the mythos of the women and some using them in a contemporary context. “Petronilla” (Music by Kent Jeong-Eun Kim and libretto by Zach Childers) imagined a scene between Lady Alice and her maid Petronilla de Meath, the first Irish woman to be burned at the stake for witchcraft during the Middle Ages, as a playful comedy; “Ár n-Athair” (music by Benedict Braxton-Smith and libretto by Nick Stephens) also took on the subject of a woman accused of witchcraft, this time revolving around the alliance between Goodwife “Goody” Ann Glover and a pirate when they are both imprisoned by the powerful Cotton Mather; “President Joan (Or the Unexpected Virtue of Sandwiches)” retold the myth of Pope Joan, but set it in the farce that is modern U.S. politics. Music by Boram Han and libretto by Cal Silberstein; The Byzantine Empress “Theodora” helped a young modern professional stuck in a dead-end job surrounded by misogynistic co-workers in the opera with music by Minhui Lee and libretto by Benji Goldsmith; “Women’s Work” (Music by Benji Goldsmith and libretto by Seth Christenfeld) also featured a modern setting for its story of an artist forced to reckon with her white privilege after a black friend confronts her over her work – a scultural bust of Sojourner Truth. And “Avery and Ainsley” took The Dinner Party as a whole for inspiration, exploring not one of the women represented, but the piece itself and its perceived role in the surreal opera by Jonathan Fadner and Scott R. Ritter. 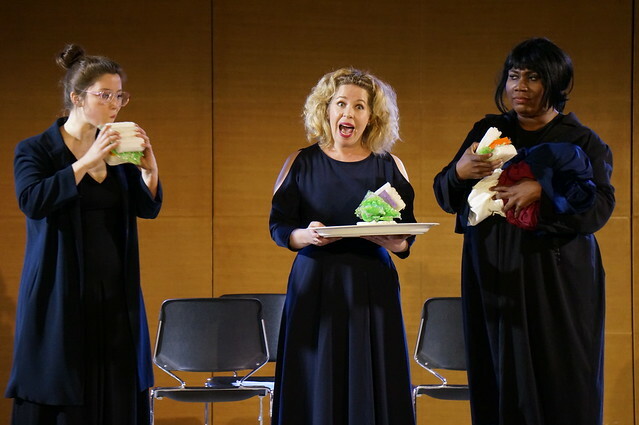 Alexa Jarvis, Amelia Watkins, and Nicole Mitchell in “President Joan (Or the Unexpected Virtue of Sandwiches)” Photo by Matt Gray. The operas were split between two performances. 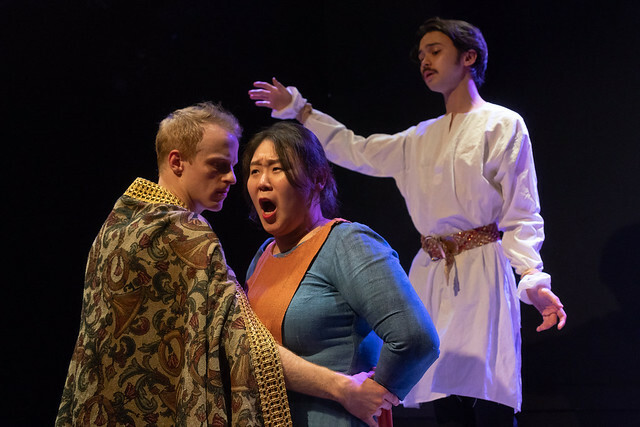 The full house at the Wednesday, May 23 performance at NYU Tisch’s Black Box Theatre saw six operas with music direction by Mila Henry, directed by students from The New School, and designed by students from the NYU Tisch Department of Design. On Sunday, May 27 at the Brooklyn Museum the remaining five operas were presented under the stage direction of Luke Leonard and music direction of James Lowe to an equally large audience who were able to then visit the installation after the performance. 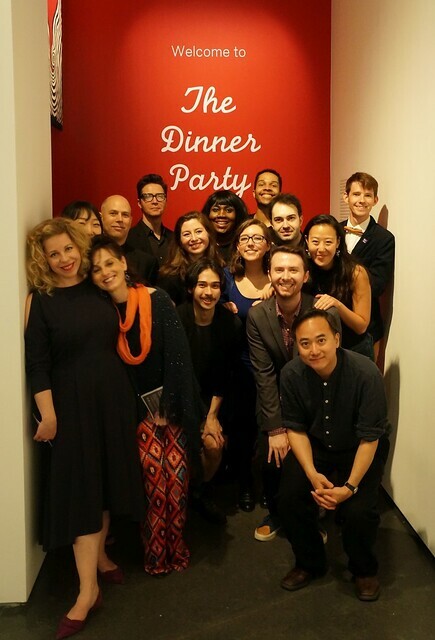 The Opera Lab was led by Professors Randall Eng of Tisch’s Graduate Musical Theater Writing Program and Sam Helfrich of the Tisch Department of Design, in partnership with American Opera Projects. American Opera Projects is pleased to announce that it has received one of the twenty OPERA America Innovation grants awarded this cycle. The grants are given to OPERA America’s Professional Company Members to support “exceptional projects that have the capacity to strengthen the field’s most important areas of practice, including artistic vitality, audience experience, organizational effectiveness and community connections.” With this grant AOP will continue to extend our training program for emerging composers and librettists into conservatories and universities to teach students the mechanics and artistry of creating new operas. This grant is for the second phase in continuing to develop our training program for music theater graduate students. In collaboration with AOP’s Composers & the Voice alum and NYU Tisch program professor Randall Eng, AOP created the “Opera Writing Workshop,” a streamlined version of C&V tailored for the music theater graduate students of the Tisch School of the Arts. With the help of the Innovation Grant, AOP will create a curriculum that can be replicated at other music schools that includes mentoring with by renowned composers and creating site specific performances for new, diverse audiences. NYU/AOP Opera Writing Workshop “Final Round”. International House, NYC, May 13, 2017. Photo by Steven Pisano. Funded generously by the Ann and Gordon Getty Foundation, the OPERA America Innovation Grants project was launched in 2016 with the intent to enable organizations within the OPERA America community to increase their commitment experimentation, innovation, and contribute to fieldwide learning. This cycle of grants will help fund a variety of innovations in the field, including fusing technology with live opera performance, partnerships with arts and non-arts organizations, as well as career-development programs, such as AOP’s. The Innovation Grants program additionally provides infrastructure as well as administrative and technical support. You are currently browsing the archives for the opera training category.